The goldfish is a very common first aquarium fish, but it takes more effort to raise a goldfish than most people realize. Under ideal conditions, goldfish can live for decades, and they can grow to 8 to 12 inches in their first few years of life. Goldfish, even baby goldfish, can live in outdoor ponds in most of North America, Asia and Europe. Centuries of selective breeding have produced dozens of varieties of goldfish. However, this process has left some varieties of goldfish less hardy than their wild carp ancestors. Different experts have different recommendations for which types of goldfish can survive over winter, which usually means that different experts have had different experiences. 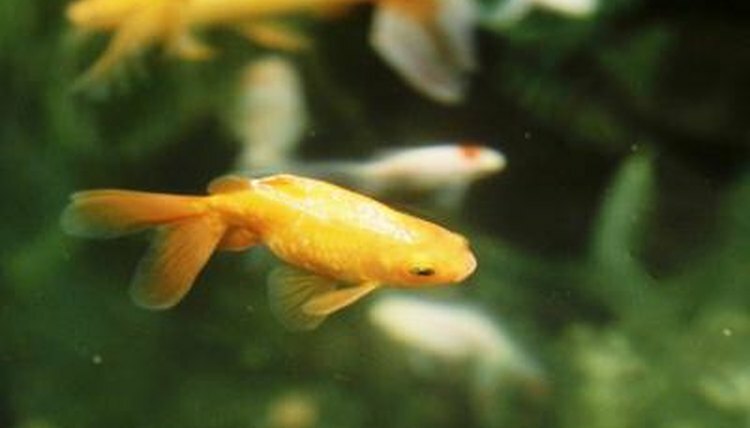 The common goldfish and comet goldfish are almost universally acknowledged as handling outdoor ponds better than other species. If you have your heart set on a fancy goldfish, ryukins, shubukins and ranchus tend to tolerate pond conditions better than most. In order to make sure your baby pond goldfish thrives, you need to set up the pond correctly. Make sure the pond has at least 30 gallons of volume per fish to ensure long-term health. Additionally, make sure the pond has a deep spot, which helps fish overwinter in the pond. You also must include live pond plants and a filter that generates water movement to keep the environment safe for goldfish. Keep in mind that if you bred the goldfish yourself, you'll need to cull the majority of the goldfish, since goldfish reproduce in vast numbers. Culling consists of "weeding out" undesirable goldfish, both to make sure the pond has breathing room and to limit the fry to desirable goldfish. In culling, you can either sell or give away the undesirable fry as feeders or common goldfish. Take care when feeding your baby goldfish. Forty-eight hours after hatching, you can feed your goldfish infusoria and newly hatched brine shrimp, foods you can either buy online or culture yourself. After their first week of feeding, baby goldfish will accept dried fish foods like flakes. You may need to grind the flake into powder at first. Keep in mind that the protein needs of a goldfish change with age. In the first year, 40 to 45 percent of their diet should be protein, 35 to 40 percent in their second year and 25 to 30 percent for the rest of their lives. Commercially available fish foods will usually list protein content on the box. If you have pond goldfish, you need to prepare the fish for winter and decide if your baby goldfish will spend their first winter outdoors. Generally, if a baby goldfish was spawned in the spring, it will most likely survive its first winter outdoors with proper preparations. If it was bred indoors outside of the regular goldfish spawning season, keep it in a large aquarium for the first winter. If your baby goldfish is overwintering in an outdoor pond, stop feeding the fish when the temperatures reach the mid-50s, since goldfish can't digest food below this temperature. Also, lower the water level once the top of the pond freezes over. This creates a barrier of air and ice which helps insulate the pond. Last, create a small hole in the ice for oxygen exchange. Some garden stores and pet shops sell pond deicers for this purpose.